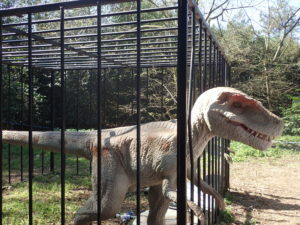 Experience walking among “live dinosaurs” at Jurassic Kingdom London! 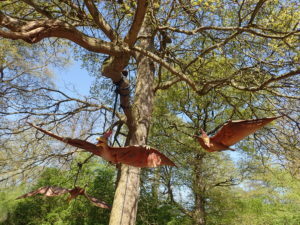 We’ve just got back from a great day out at Jurassic Kingdom London, located at Osterley Park in Isleworth. The day exhausted me, but as the event is only on in London for one more week (till 17th April), I thought I would write my blog review straightaway so it can benefit more people! If you haven’t heard of Jurassic Kingdom, it’s an animatronic display of dinosaurs, complete with moving parts and realistic sounding roars. The setting is beautiful, in the National Trust property Osterley Park. The display is only on in London for 2 weeks in total, after which it moves on to other parts of the UK including Birmingham and Manchester. We all enjoyed our day out at Jurassic Kingdom, and we were lucky to have glorious weather for it! Getting there was not too difficult as we travelled by car. (I’m afraid I can’t comment on the public transport links.) We were able to park on a residential road nearby, thanks to a tip from another mum. There is a huge car park within the gates of Osterley Park, and it costs £7 to park for the whole day. On the weekend there is some free parking on the residential roads. Whether you park in the main car park or a residential road, you will be walking a lot. Remember to bring comfortable shoes and your buggy! We actually brought 2 buggies, one for our 2 year old and one for our 4 year old. The 4 year old can walk just fine, but it was useful to have once he got tired. The terrain is very uneven, which can be a problem for buggies, but we were able to manage ok with a Maclaren. The entrance to Jurassic Kingdom is located just after the lake, to the left of Osterley House, which you can’t miss seeing – it’s the main building you’ll see with huge grand columns. 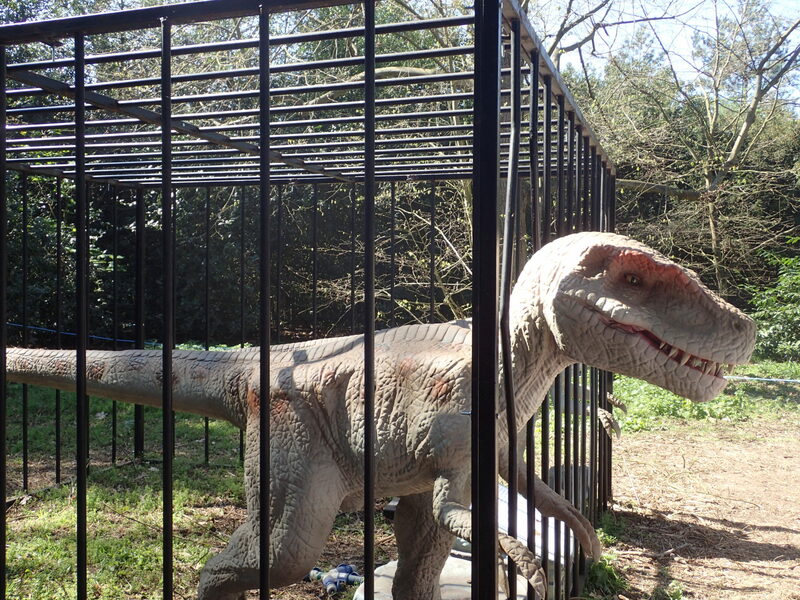 Within Jurassic Kingdom there are portaloos, or you can use the toilets around the corner from the cafe at Osterley. I recommend bringing some tissues as by the end of the day there was no toilet paper! There are places to buy food and drinks. I did not heavily investigate this as we brought a picnic, which I recommend, but I noticed hot dogs, noodles, and curly fries were on sale at various stands. There was a virtual reality game for £5. We didn’t try it. 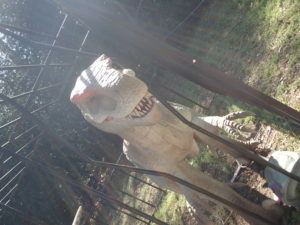 An impressive Tyrannosaurus Rex robot greets you immediately. Staff will check your tickets (if you have a smartphone you can download these and save them to your phone for scanning) and you pass through some barriers you begin walking around the trail. There was no queuing at all at this point which was great, and we sailed right through. Just to note, no map or guide is provided. As it was a Saturday today as well as Easter holidays it was incredibly busy, and this was a slight drawback to the whole event. 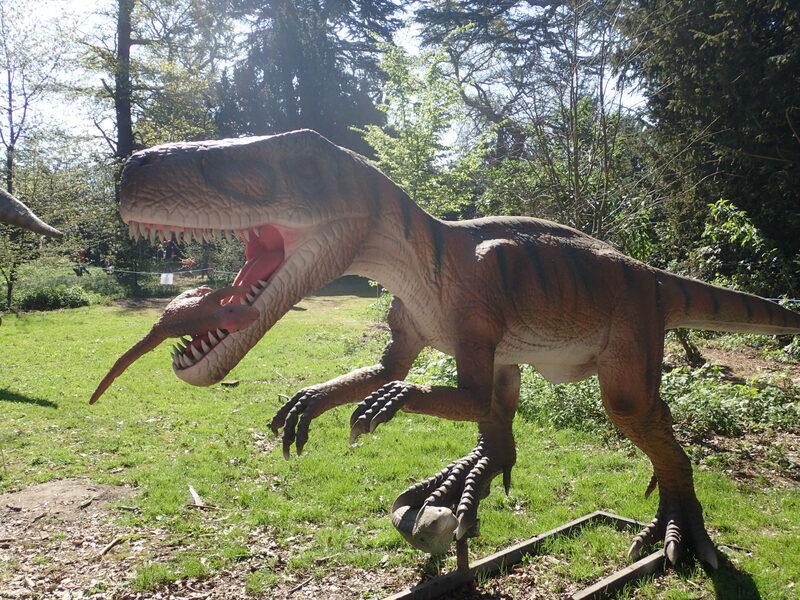 In combination with the lovely sunny weather and loudly roaring dinosaurs some of our children were finding it all a little intense! But things did improve as we found some shady, leafy spots to enjoy where the children found logs to sit on and sticks to play with. They actually seemed to really have the most fun mucking around in the forest! 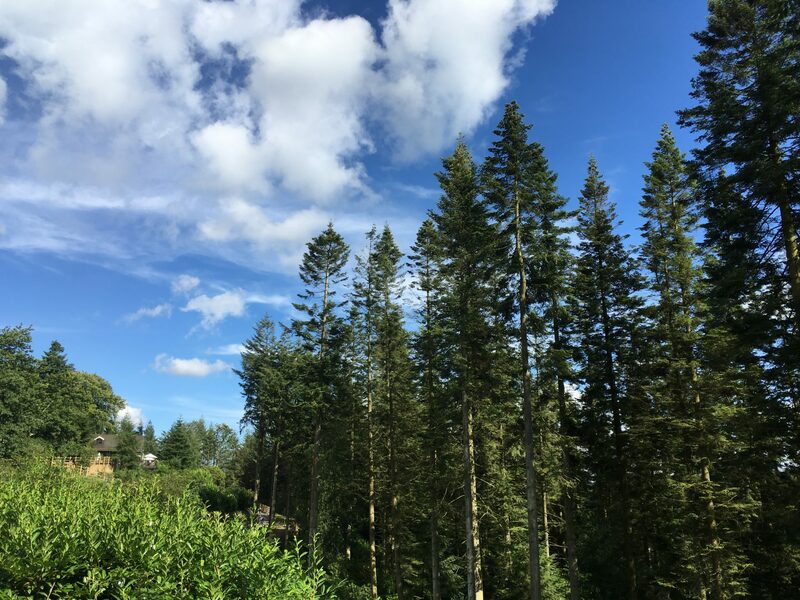 I recommend taking time to hang out and find a nice spot to play, as there are many beautiful nooks to get away from the crowd. Halfway round the trail (about 30 minutes in, for us) there is a clearing where there are more food stands and a sandpit. 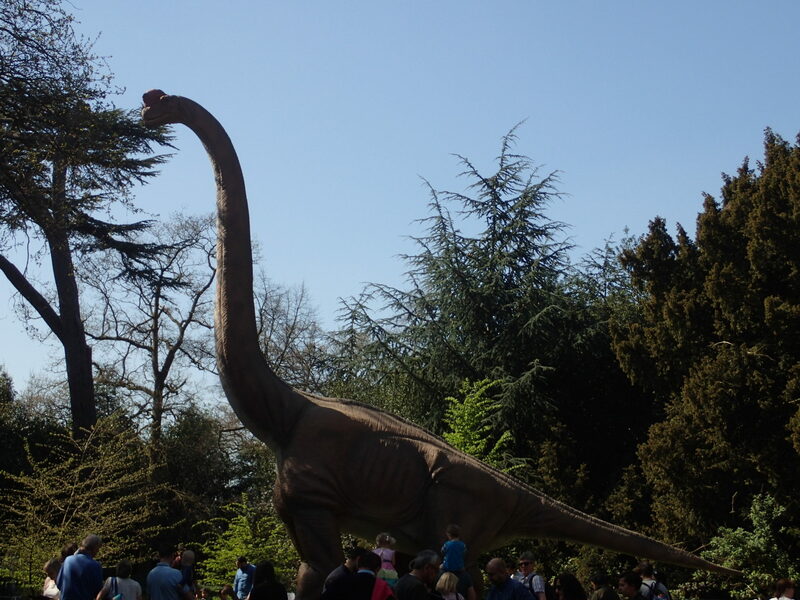 There was a moving dinosaur which your child can ride here for £2. A little further on from the food stands is a large tent within which a documentary was playing. There are several rows of chairs, and a few dozen people were taking a break from the trail there. After the tent are more portaloos, and you can find a sizeable hatching dinosaur egg here. On the final part of the Jurassic Kingdom trail there was a place where your child can sit on the back of a small dinosaur. This makes a great photo opportunity. There was also a large dinosaur head which you can climb into, which also seemed like a great place to take a photo. Unfortunately the queue was quite long, so we didn’t wait to do that. Once you get to the very end of the trail you return to where you entered. There are souvenirs like T-shirts and soft toy dinosaurs on sale. All we were really interested in by then was buying ice creams, but the ice cream stall outside Osterley cafe accepts only cash, and I had forgotten to bring any! So it was yogurts and a chocolate brownie from the cafe instead. This was not such a bad thing in the end! We spread out our picnic blanket on the grass by the lake and the kids enjoyed playing hide and seek in the shade of the trees. All in all a lovely day out. A must for all dinosaur-lovers. You should be prepared for a lot of walking. Bring buggies, cash, tissues, bottles of water, suncream (if you’re lucky like us with the weather) and a picnic blanket. Enjoy! Escaping Raptor – watch out! Very useful post, thank you! My little fellow would enjoy it as well… might plan a trip over the long weekend. Glad you found it useful. Thanks for your comment and hope you have fun! Sorry to hear that, hopefully Jurassic Kingdom will expand to Australia one day, you never know!